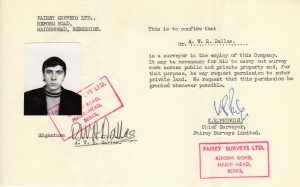 Ross was a Land Surveyor at Fairey Surveys from 1968 to 1970, and on coming across our website, has contributed an article about the Land Survey team during his time there, along with a few images. The surveyors didn’t spend much time in the office, but we still have contacts with a number of the team who were around then. We can pass on messages! The whole text of the article is below, but it’s also attached as a Word document, so it can be downloaded and printed. My name is Ross Dallas. I was fascinated to come across this marvellous site dedicated to Fairey Surveys Ltd. I worked for the Company as a Land Surveyor for two years from 1968 to 1970 (see photo below). I’m writing this piece now, as going through the site, I can’t find any mention of us terribly important surveying guys! In those days, the Chief Land Surveyor was Rodney Pringle. A fine chap, who I believe was related to the Pringle family of tweed manufacturers from south Scotland. I think we had about ten land surveyors in total. Peter Green, John Cripwell and Roy MacDonald I recall were three of the senior land surveyors at the time. Some of the young lads were myself, Ian Jarvies, Graham Jarvis and Tim Bale. Our main business was photo control work. In those days, the Company had many contracts around the UK, much of it for road building programmes. Once the aerial photography had been procured, it had to be ‘controlled’ to provide coordinates for the plotting work. We traversed up and down the land, tying into OS trig points and Bench Marks. I think there was a secondary stage of field verification, but personally I was not involved with that work. The mapping was mostly 1:500 scale from photography at 1:2,500 to 1:3,000, taken by the Company aeroplanes of course. There was OS mapping of all the UK, but it was at too small a scale, probably needed revising and was not accurate enough for road building. As well, we put in lots of semi-permanent survey markers along our traverses for subsequent setting out. Even in my fairly short time with the Company, I worked all over – the Luton/Dunstable Bypass, the M6 in Cumbria, the Tranent Bypass in Scotland, just down the road on the M4 three-lane widening etc. Fine in the summer, but your hands froze to your Wild T2 theodolite in the winter! Mind you, that wasn’t as bad as on occasion having to travel in Peter Green’s Mark I Land Rover – heater, what heater?? We made use of the Geodimeter Mark VI for ‘distance’ readings. It took about fifteen minutes to take a reading as you repeatedly ‘nulled’ the dial. Then, back in your lodgings that evening another fifteen minutes each to compute the distances – assuming that you didn’t make a mistake! Then, the traverses had to be computed before you left site, just to be on the safe side. We had a special large form for traverse computations, devised I think by Rodney. All the sums were done on mechanical calculators, of the ‘Brunsviga’ type. Peter Green was very proud of his ‘Curta’ calculator – a beautiful, tiny precision calculator that sat in the palm of your hand. I have to say that I don’t think we young surveyors in particular were very popular at Reform Road! We swanned in and out the ‘office’ between jobs – and of course when in the office didn’t seem to have much to do! We did in fairness have to provide our own transport, and got some ‘mileage’ money. Did I mention that we all seems to have, err, sports cars? Ian Jarvies specialised in bending Triumph TR3’s. Did I mention that I had a Lotus Cortina, Mark 1A? Well, I needed the boot space for all the tripods . . .
We did do some work in the office, you know! In the field, we had 9” x 9” ‘contact’ prints of the aerial photos, which we had to incredibly carefully prick with the location of the control points. 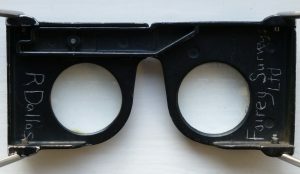 I’ve still got my ‘Casella’ hand stereoscope, with ‘R Dallas Fairey Surveys Ltd’ scratched on the underside (photo attached!) Company property, hope they don’t want it back. Anyway, inevitably, from time to time there would be problems of identification, and we would be called into the plotting room to sort it out. I remember well the remarkable sight of a dozen or more photogrammetric plotting machines filling the room, operators glued to the eyepieces, whirring away with that distinctive co-ordinatograph whine, as they moved from point to point. From looking through the website, I recognised quite a few names of the operators and staff of the time, but the one for some reason that I had most dealings with was Bill Cheffins. A lovely man, who always seemed to have time to talk to you and discuss problems without giving you a hard time! I think I talked to him most, as I had carried out an architectural photogrammetry project at college and he had carried out the remarkable survey of the north face of Edinburgh Castle (see Ref below). He used one of the Company aerial survey cameras on its side, photographing from Princes Street Gardens. An ingenious solution, but perhaps not too practical for everyday architectural work! Also, we had a (very) slight personal connection, as I recall Bill was a mad Scottish Country dancer and had quite separately met my sister at dances in London. A tragic loss when he died quite young. And then there was overseas work . . . Even in my short time, I was very privileged to be sent on a couple of ‘overseas’ jobs. The big one was to Saudi Arabia, for three months to the Ta’if region, where Faireys had a big contract to carry out photo control and mapping for a large block of aerial photography. I think this was the first contract for topographic mapping in Saudi after the major triangulation programme across the whole peninsula? We had a team of four surveyors – John Cripwell was the lead surveyor, then Roy McDonald, then a Polish origin lad whose name I’m sorry I have forgotten. Roy McDonald was the real joker in the pack – he loved telling jokes, and ended them with one of those infectious laughs so you couldn’t stop laughing yourself. John was a South African, and he ran the programme in what, shall we say, was rather a ‘colonial’ manner. I got a real bollocking from him one day. Our Toyota trucks were really tough vehicles – they looked like something left over from WW2. They had one odd fault in the heat, the brakes quite rapidly became ‘spongy’ and mine needed attention. One day, John had to borrow my truck for some reason. Unfortunately, his style of driving was to drive on his brakes. Don’t think he believed in stopping for the locals. Well, you can imagine the rest, but fortunately that day he never actually hit anything! Anyway, we sortied forth in our Toyota trucks, covering many kilometres of dirt roads. These dirt roads developed corrugations and you quite literally bounced along. It didn’t seem to matter whether you were going fast or slow. We usually had to do observations very early in the morning before the haze and ‘shimmer’ got too bad. We were working to the triangulation scheme which as above had been put in a few years previously. But there was a problem. Most of the concrete block triangulation points had been stolen by the local Bedouin! Luckily, they didn’t know about the witness marks, so we got by! I remember John organised a big pow-wow with some of the local Bedouin chiefs to try to stop them removing the trig points. We sat on the floor cross-legged in their tent, eating dates and sipping ‘chai’. I was also sent to Malta. Sorry, Rodney, but that was really a holiday! How I spun it out to a week I do not know! We were doing a survey for a proposed Marina just north of Valletta. It wasn’t even triangulation work – just some measured distances plus level points for two pairs of stereo photos. The Architect guys in charge also seemed to be on holiday. They had a lovely sailing dinghy . . . I left Faireys in 1970 to take up a post first with the Royal Commission on Historical Monuments (RCHME) and went on to pioneer the adoption and methodology of architectural photogrammetry in the UK (see Ref). As a result, working in such a different field I lost contact with my fellow land surveyors and others that I knew at Faireys. A number of Companies got into close range and architectural photogrammetric work, such as Huntings and BKS, but I don’t think Faireys ever really did much in that direction? To be honest, I don’t think I was a natural fit at Faireys. In the first place, for those days I was one of those unusual beasts – a Graduate from Glasgow University. I guess also I had quite a strong Glasgow accent, rather different from the ‘Thames Twang’ of most staff! Then, folk seemed to think I had a lot of opinions! Can’t think why. Well, I can. Fairey staff were fantastically experienced, skilful, hard working and fast. But I think it’s true to say that in those days many staff had a ‘military’ background of some sort – ‘Ours not to reason why!’ So asking a simple question like why do you do it like that, could be misinterpreted . . . But I hugely valued my time at Fairey Surveys and gained much practical experience. I hope this short ‘snapshot’ of a brief period will be of interest – and I hope it might trigger some other of the land surveyors to offer their reminiscences over a longer time. Even better, they might disagree with me! 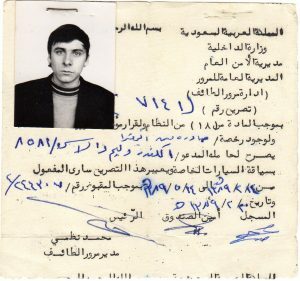 Regretfully, I don’t seem to have any photos of survey work in progress, either of UK work or from the Saudi trip. Perhaps some others can contribute some photos of surveying operations?